The summer is a great time to can produce. Farmers markets and most supermarkets are brimming with fresh fruits and veggies this time of year. 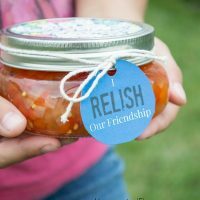 It’s become a tradition over the years for me to make a red pepper relish for my friends (they normally get it around Christmas). 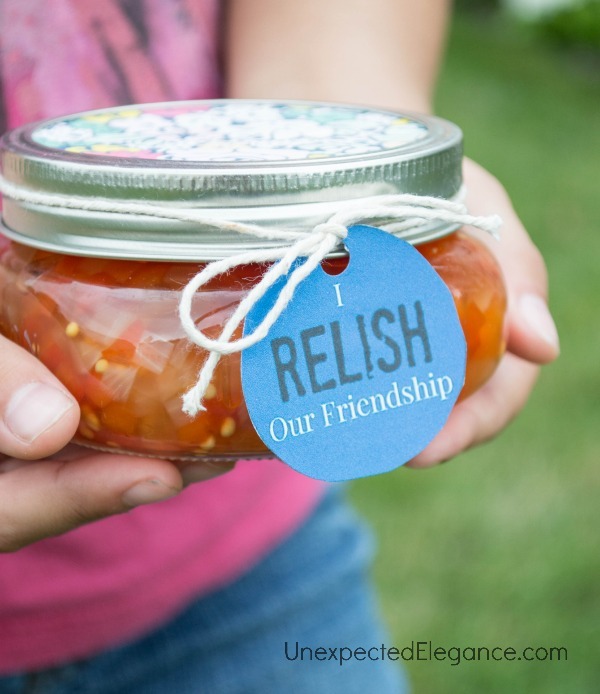 This stuff is delicious and it’s great to have on hand for a quick appetizer for a party. 2 heaping Tbs. of mustard seed. Mix all the ingredients into a large pot and bring to boil. Then let it continue to boil for about 25 minutes (until it starts to thicken up a little). Combine all the ingredients into a large pot and bring to a rolling boil. Let boil for about 25 minutes then transfer to canning jars. If you are eating immediately, put in the refrigerator. 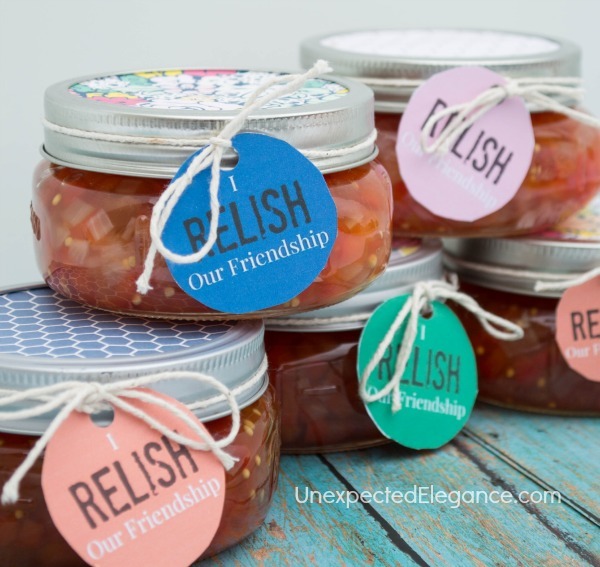 If you are canning for later, make sure to follow proper canning procedures and seal at once in hot, sterilized jars. Since most of the time these go to friends, I decided to make some cute tags to attach to the jars. For the FREE DOWNLOAD, click on the image. And a few pieces of craft paper “round” out this gift. 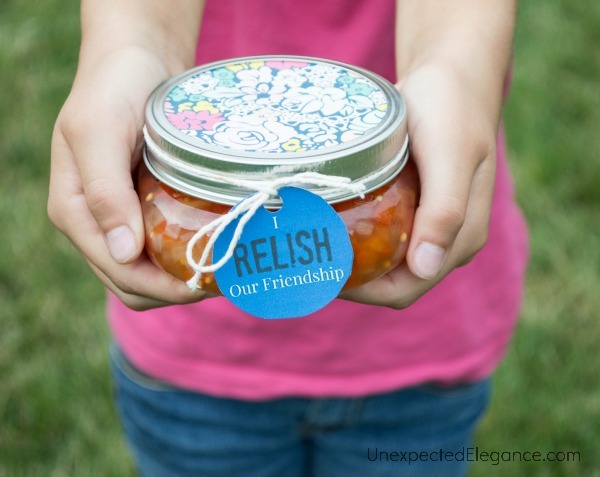 Sharing food is one of the oldest forms of expressing friendship. It means you actually took the time to make something (rare in our day) just for that person. AND who doesn’t love to eat!?!? 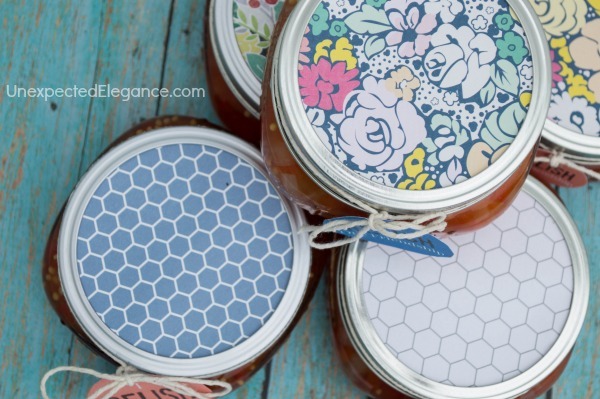 For more canning recipes and information, check out my Canning 101 post. Quick question, what type of red peppers? Hot or bell? I absolutely love this idea and the printable. I use the sweet red, orange and yellow ones. It is so good! !